ELEANOR ROOSEVELT. Typed Letter Signed, to Flora E. Shirah, February 27, 1951. 2 pp., 7¼ x 10¼ in. The Universal Military Training Bill which is now being considered will mean that eighteen year olds will enter Universal Military Training because most boys will be finishing their high school and there will be less upset if they do their military service then whether they are going to work or whether they are going to college. If they are college material they will probably be sent for college training since great care will be taken not to deplete our essential leadership either for skilled people in medicine, engineering, etc. I do not attribute the motives that you do to our representatives. We have delayed in accepting Universal Military Training until we accepted the fact that we were going to have for a number of years, a situation in which we would have to be constantly prepared unless the USSR was to feel free to attack us. Since that is the case, we must now have Universal Military Training. I suppose you can say that anything which is obligatory is in some degree similar to communism or fascism. The only difference here is that we the people, are consulted and it is our representatives through whom we speak when we accept a measure of this kind because we decide that it is necessary. I think you are a trifle emotional when you call 18 year old men, children. I think they should be allowed to vote. I think you are wrong in saying that in the last war men received one to two years of training. Some men may have stayed in training camps that long for various reasons but not because it was essential to give them that amount of training. I am sorry if you feel that you can not trust your government. I feel that we have some very fine men as our representatives and I feel that they react to what citizens want. You can not expect always to have one man who will carry the burdens of the whole democracy and express their thinking for them. Now we have to do it for ourselves. We are not alone in Korea, many nations are represented on that frontier and their support is valuable but we have to bear the brunt as we will have to bear the brunt in many other undertakings because we were spared during the last war from war in our own country and therefore today we are the strongest nation in the world. A mothers’ rebellion would certainly be a novel and interesting undertaking because there would be a division even among the mothers. I do not know, nor could I tell you exactly how you could find out how many men in Congress have eighteen year old sons but I am sure there are a great many who have. I am getting into the group where my grandsons are getting ready for service. Incidentally any boy who is in school will be permitted to finish the school year. I understand your emotional reaction but I hope you will think this question over carefully and realize that you have in the man power office a very careful adviser, Mrs. Anna Rosenberg who will look after the interests of our young people. Her only son served in Europe during the last war. In his final State of the Union Address in January 1945, President Franklin D. Roosevelt briefly mentioned his intention to support the creation of a universal military training program after World War II ended. 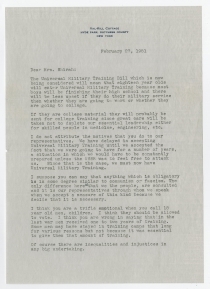 In October 1945, President Harry Truman recommended a specific Universal Military Training (UMT) plan to a joint session of Congress, which held hearings but largely chose to ignore the President’s request because of funding concerns. Opponents insisted that the atomic age had rendered large armies obsolete. Truman asked for UMT in successive years, but largely ignored his request. However, the outbreak of the Korean War in 1950 brought the issue to the fore again. Secretary of Defense Louis Johnson forwarded his agency’s program to Congress with the note that “recent events in Korea have only served to emphasize the fact that universal training is an essential element of an integrated and balanced system of national security.” The President continued to support UMT, but other issues directly related to the war were more pressing. Shirah also wrote to Senators Robert A. Taft of Ohio and Brien McMahon of Connecticut, and President Harry Truman. She had received a response only from Senator McMahon. Roosevelt’s patient response to Shirah, offered here, is a strong defense of Universal Military Training to meet the threat of the U.S.S.R. While sympathetic to a mother’s concerns, Roosevelt makes clear her support for UMT. Acknowledging that large programs often have “inequalities and injustices,” she also defends Congress and American involvement in Korea, while offering a primer in citizen responsibility. 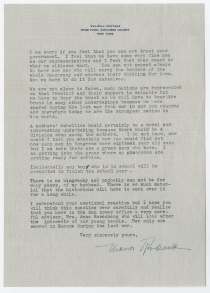 At the end of her letter, Roosevelt assures Shirah that America’s youth had a strong advocate in Anna Rosenberg (1902-1983), who served as Assistant Secretary of Defense in charge of manpower from November 1950 to January 1953. When Dwight D. Eisenhower superseded Harry Truman as president, UMT lost its most vocal supporter. Congress retained the option of selective service, which led to the very unpopular Vietnam War draft. Eleanor Roosevelt (1884-1962) was born in New York City, was tutored privately, and attended an English finishing school. In 1905, she married her distant cousin Franklin D. Roosevelt. They had six children, one of whom died in infancy. She actively supported her husband’s political ambitions, campaigning for him, and representing him when he was Governor of New York (1929-1932) and President (1933-1945). After FDR’s death, Harry S. Truman appointed Eleanor Roosevelt as the first U.S. Representative to the United Nations, where she served from 1947 to 1953. She also served as the first chair of the UN Commission on Human Rights. In 1961, John F. Kennedy appointed her as the first chair of the Presidential Commission on the Status of Women. Flora E. Wyse Royce Shirah (1906-1992) married Wingate Royce (1898-1961), a stone setter, in 1928. By 1930, they lived with his mother in Middletown, Connecticut. In 1940, she and her two sons lived with her mother in a suburb of Hartford. She divorced Royce and married Zelmar Shirah (1905-1971), an Alabama-born stone setter. They divorced in 1954. From the mid-1950s to the mid-1960s, she worked as a bookkeeper for Pratt & Whitney, manufacturers of aircraft engines. While Roosevelt’s observation about the quantity of material is certainly true, the first serious biography of Franklin D. Roosevelt began to appear the following year. Frank Friedel published four-volumes between 1952 and 1973. James McGregor Burns published a two-volume biography in 1956 and 1970. 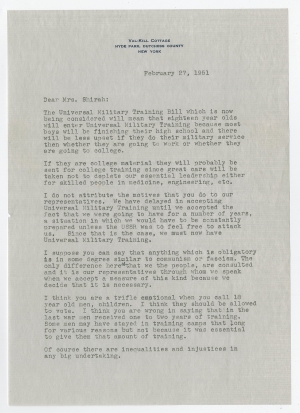 Flora E. Shirah to Eleanor Roosevelt, February 10, 1951, Eleanor Roosevelt Papers, Box 1638, Folder Shi-Shn, Franklin D. Roosevelt Presidential Library, Hyde Park, NY.